Hendricks County offers three run/walk events in March. Distances range from a 5K to a half marathon. Types of courses vary as well, so finding the perfect event to fit your running/walking ability should be easy. Here is a run down of our March events. The Spring Fling 10K and 5K takes place at 9 a.m. March 4 at the Richard A. Carlucci Recreation and Aquatic Center, 651 Vestal Road, Plainfield. The course consists of sections of the Plainfield trail system. This is the perfect opportunity to experience that popular trails system. Click here to register. The Tomahawk Trail Run 8K occurs at 9 a.m. March 11. This run/walk takes you through the beautiful trails of Blanton Woods, 625 N. Washington St., Danville. The challenging course consists of hills and some rough terrain. Register here. 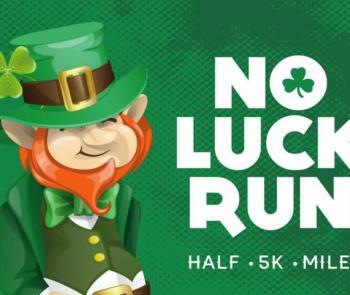 A local favorite, the No Luck Irish Run, is back this year! This event takes place just a few days after St. Patrick&apos;s Day on March 19. Enjoy running/walking with fellow leprechauns! The half marathon begins at 8:45 a.m. and the 5K starts at 8:55 a.m.
Kiddos want to participate? The kids half mile dash begins at 8:30 a.m. The start/finish line is located at the Claddaugh Irish Pub, 2499 Perry Crossing Way #150 inside The Shops at Perry Crossing in Plainfield. The course is flat and fast running through the streets of Plainfield. After the event, you are rewarded with a free green beer and entry into an after party at Claddaugh Irish Pub. This is also a great opportunity to explore the The Shops at Perry Crossing. For more information regarding registration and the charity challenge ("Stop Hunger Now"), click here. Join Hendricks County runners and walkers this March (hopefully the weather continues to be mild!). Check out these events and choose the right distance and course type that fits your abilities and helps reach your fitness goals!